A news conference in Tokyo to announce details about the 2015 Premier 12 on Monday. Japan was the first-ever champion of the World Baseball Classic, lifting the championship trophy on foreign soil in 2006. If Samurai Japan repeats the feat at the inaugural Premier 12, the Japanese will get to do all their celebrating at home. 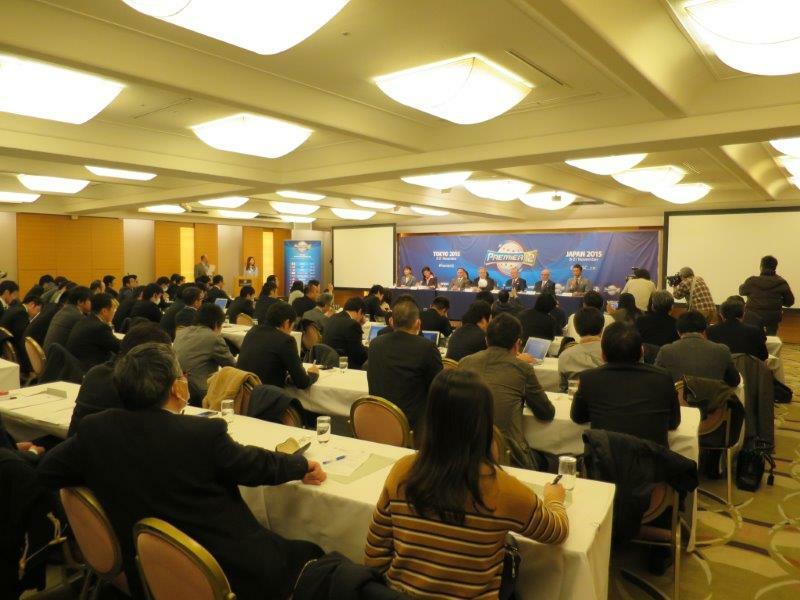 Japan has been added as a co-host for this fall’s 2015 Premier 12, World Baseball Softball Confederation (WBSC) president Riccardo Fraccari revealed during a news conference at a Tokyo hotel on Monday. “The idea (for the Premier 12) was born because the strongest countries asked many times to play more than once every four years,” Fraccari said. The 2015 Premier 12 will be held in Japan and Taiwan Nov. 8-21. The Premier 12 will pit the top 12 national teams in the world against each other during a nine-day tournament. The teams will be split into groups of six in a round robin format for the opening round. The top four teams then advance to the knockout stages, beginning with the quarterfinals. The event will commence with a grand opening game at Tokyo Dome, with the round robin and quarterfinal rounds scheduled to be held in Taiwan. Tokyo will host the semifinals and final. There was no qualification process for the inaugural Premier 12, with the field consisting of the top 12 teams from the final WBSC World Baseball Rankings of 2014. Leading the way is top-ranked Japan, which will be joined by the United States, Cuba, Taiwan, Netherlands, the 2013 WBC champion Dominican Republic, Canada, South Korea, Puerto Rico, Venezuela, Italy, and Mexico. The Premier 12 replaces the Baseball World Cup, as the WBSC now crowns a world champion during the World Baseball Classic every four years. The aim of the Premier 12 is to bring the best players in the world together more than once every four years. The event will award the highest amount of world-ranking points of any international baseball tournament, and Fraccari hinted it could also be used as a qualifying stage for the Olympics, if baseball is restored to the program. The WBSC is hoping the Premier 12 can help convince the International Olympic Committee of the sport’s global appeal. Baseball and softball lost their places in the Olympic program following the 2008 Games in Beijing. The sports weren’t present during the 2012 Games in London and won’t be on the program for the 2016 Games in Rio. “We will show IOC that baseball is a global sport,” Fraccari said. “It’s not only an American sport, and is played on every continent. The reason why we used a different approach to select the teams, through the ranking, is because the ranking really is a unit representing the global power of a country. Because in the ranking we consider participation in all the events of the WSBC, meaning the under-12, under-15, under-21 and senior (competitions). Another announcement made Monday was that Samurai Japan would face a team of European players in a two-game series March 10-11 at Tokyo Dome. Kokubo says he’ll monitor candidates for the Japanese team while NPB clubs are conducting their spring camps, but expects his squad to largely be made up of players who represented Japan during the MLB-Japan All-Star Series in November. The European team will include players from other leagues and could even feature NPB stars such as Tokyo Yakult Swallows slugger Wladimir Balentien, a native of Curcao who represented the Netherlands during the 2013 WBC, and Orix Buffaloes pitcher Alex Maestri, a native of Italy.